A content marketing strategy is a plan for building a relationship with your target audience by giving them relevant, useful content. It means you’ve put in the time to understand your audiences and distribution channels, and you have defined your business goals. Whether you’re looking to increase brand awareness, drive sales, or foster customer loyalty, your content marketing strategy is your vision for success. Your content marketing strategy needs KPIs — key performance indicators — that will demonstrate how effectively your content is working. Begin by stating your business objectives: what are you hoping to achieve with this content? Are you hoping to drive traffic, increase subscribers, gather leads, boost sales, start a social conversation? Great content starts with goals and a purpose. Who is your ideal audience, and what do they care about? Use tools like Google Analytics and Facebook Page Insights to gather demographic information and get insight into their key interests. Listen to existing customers, and spend time on relevant discussion forums and engaging in social media conversations. Recognize the tone and topics that resonate with your target market, and base your content strategy around them. 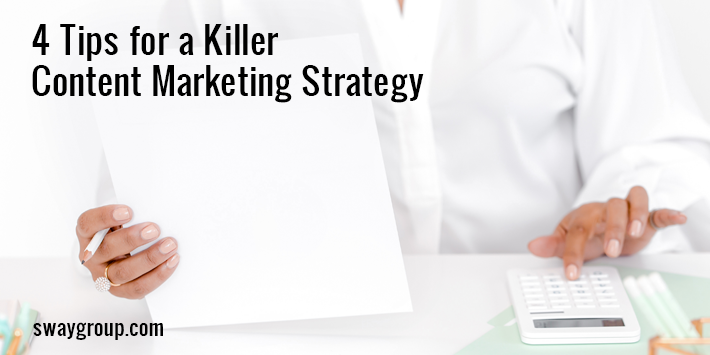 Now that you have a strategic framework in place, you can start thinking tactics. Choosing from the near-endless variety of format and platform options — high-impact visuals, long-form blog storytelling, shareable video snippets, etc — will depend on who you want to reach and the outcome you’re hoping for. A craft product aimed at a DIY audience would likely do well with a Pinterest-ready step-by-step blog tutorial, for example, while Instagram is an ideal place to market a beauty product for millennials. Seasonal products have obvious choices for scheduling and positioning, while other brands may take some creative thinking: i.e., a home staple promoted as a back-to-school necessity for college students. Unfortunately, it’s not enough to create that amazing content, you have to be strategic with your distribution in order to reach the right people. Developing a strong content calendar will help capture attention and build loyalty over time. After the content development and distribution, the dust has settled, it’s important to review performance to get a good understanding of how to improve. Are you seeing the engagement you wanted? Maybe your content doesn’t feel authentic enough. Today’s savvy consumers are largely tuning out ad content in favor of user-created recommendations, which means that influencer or influencer-like content has a far better chance of resonating. Likes, views, clicks, comments, tweets, hashtags, repins, shares: they don’t always happen overnight, as much as we all love those viral stories. Gaining organic traffic can be a systematic process, and it takes commitment and planning. With these content marketing guidelines and tips in place, your strategy can really take off — and at Sway Group, we’re here to help you every step of the way. Reach out today to learn more about our services and what we can do for your business.